Updated kitchens and bathrooms top the wish lists for homeowners considering remodeling projects and for buyers on the hunt. With multi-generational households on the rise, fully appointed guest suites or dual-masters are also increasing in popularity. Whether your guests are full-time or part-time, the functionality of their own private bathroom is hard to deny. A bathroom renovation recoups from 55-65% of its cost at resale, thus home appraisers suggest budgets for guest or powder baths are best limited to 5% of your home’s value, with master baths stretching to 10%. Over time, the cost recoup percentage for a bath remodel will increase as the house appreciates. Choosing a timeless design will bring back even more than what the clients pay originally in a good housing market. These refreshed spaces not only pave the way for future buyer interest, a fresh and spa-like space can greatly improve your quality of life. 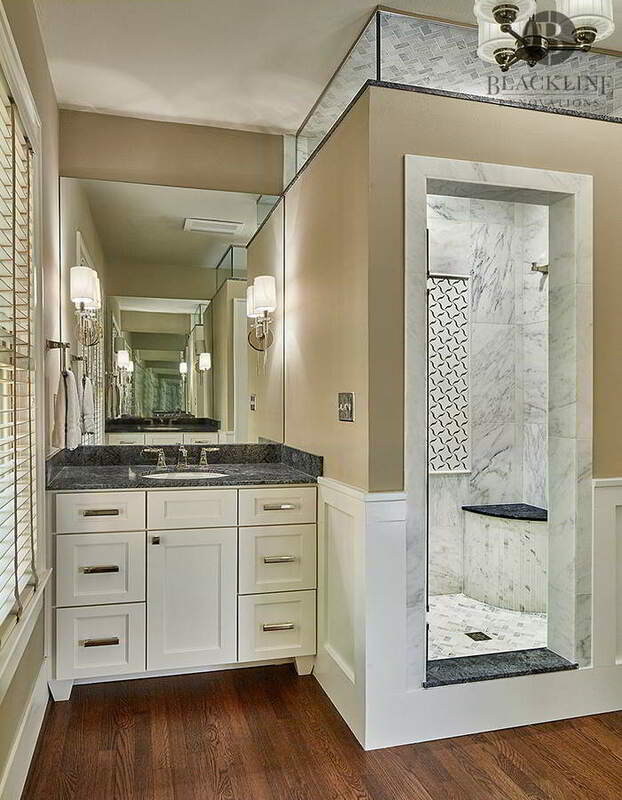 Design options abound, and natural stone materials for floors or showers are enticing. Consider cost-conscious choices like stone-look porcelain tile to offer the same style and texture with less expense and need for maintenance. Replacing but not moving plumbing fixtures is another way to keep costs in check. Popular bathtub and shower trends see freestanding tubs that require less floor space in addition to a more oft-used separate shower in remodeling plans. Homeowners planning to age-in-place may also want to consider accessibility upgrades with their remodel. From extra space for walkers or wheelchairs to grab bars or floor-level shower thresholds, features that improve maneuverability ease challenges for your guests or yourself in the future. Alternately tub-to-shower conversions, where the tub is removed altogether to make room for a larger shower, enables guests to use a bath seat or bench. Improving your guest bathroom not only ingratiates you to friends and relatives but can enable extended independence and improved safety for you and loved ones in your home at all ages. Making clean, simple, and somewhat neutral choices for the major components can improve resale value, while allowing your personal style to guide choices for easier-to-replace accessories like lighting and hardware.